Feather Meston (now Ven. 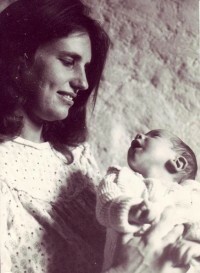 Thubten Wongmo) in 1970, Geneva with her son, Daja Wangchuk. The only explanation that makes any sense as to how I ended up walking up the hill to Kopan in 1973 is that the walk up that path actually began in various past lives. I mean, think about it. How else would a young, nice-enough-looking social worker turned hippie gal from a rather famous Jewish Hollywood family possibly end up at a Tibetan Buddhist monastery in Nepal? Traveling with her bearded Jewish hippie-artist-poet ex-husband and two-year-old son. But of course, it’s different these days … anyone who knows anything eventually finds Kopan and takes a meditation course, preferably the famous annual November course. 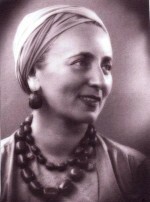 The past life thing makes even more sense considering my strong connection with my dear maternal, Hungarian Jewish grandmother, Bernardine Szold, who had traveled the world in the 1930s and 1940s and lived in Shanghai, China for over a decade. Her Beverly Hills house was filled with Chinese lacquer furniture, a 4-foot statue of Lao Tzu, Balinese puppets, jade pieces, and huge Chinese scrolls adorning the walls. Her ear lobes had become elongated from heavy jade ear rings. She would talk to me about reincarnation and karma all through my childhood, things she had learned about from reading various Eastern masters. So basically all my life I “knew” there were past and future “incarnations” – as she called them – although I never spoke about these things; they were just there naturally in my psyche. We would do yoga positions together on her Chinese rugs and when she needed an “answer,” she’d call up one of her eccentric friends for an I Ching reading. She even organized for me to go to one private school started by Krishnamurti in Ojai, California. Baby Feather with parents, 1945. My path to Kopan took some detours before reaching the monastery, to say the least. I moved around almost every few years with my beautiful alcoholic mother, went to about a thousand different schools, and when the poor thing tried to commit suicide when I was 14, my grandmother organized for me to join my father (who I hadn’t spent much time with throughout my childhood) and his new wife, Bette Ford, the bullfighter, on their extended honeymoon in Europe. Bette was also an actress and model and despite having plunged a sword into the hearts of hundreds of Mexican bulls, became a sort of a glamorous big sister. Bette Ford in Mexico bullfighting, c. 1955. I ended up spending two years in Europe where I learned to speak some French and totally enjoyed all the amazing culture. I returned to the States to complete the last year of high school and went to Occidental College (where President Obama went for two years) in Los Angeles. When it came time to make a decision about my future I had no idea what I wanted to be but one day when asking myself what I should do a voice answered: “Help people.” Again, considering that no one in my family or at any of the many schools I had gone to had ever even said the words, “It’s good to help others,” I can only surmise this idea came from my gurus in some past lives. Or something. So I asked myself how I could help people and only two ideas came up: to be a teacher or a social worker. I liked the sound of social worker, it just sounded kind of friendly and universal. I had no idea what it was, but I had already worked in Watts (the poor black area of Los Angeles) one summer as a volunteer for Project Head Start, a pre-school program for underprivileged children. Somehow, despite not having been an “A” student, but rather a beer student at the local college pub most of the fours years at Oxy, I was accepted at USC Graduate School of Social Work. Part of the program was to work in an actual California Welfare Department during the summer breaks, so I ended up as a child welfare worker for two years, where most of my clients were residents of the bleak, depressing housing projects. Now you need to understand that this was in the late 60s, in California … need I say more? Basically, I lived a double life: social worker gal during the week, hippie gal in full regalia (long skirts and hair, beads and all that) on the weekends, blissfully enjoying to the rock concerts, love-ins and of course, the ever-present psychedelics. My career as a social worker ended abruptly courtesy of the L.A. police department (no need to go into details) which I have to sincerely be thankful for, as otherwise, I might have not found the road to Kopan. The shock of losing my job and career pretty much unbalanced me for a while, but was eventually sort of saved by Lawrence, the bearded artist guy you met at the beginning of this story. We ended up getting married (something I never imagined doing) and driving to the hippy paradise of New Mexico, just for a change of scenery. Upon arrival in Taos, I was informed that my mother had committed suicide. After about a year of hanging out with other young hippies, I got sort of tired of making macramé belts, baking bread in wood stoves and the stoned drumming circles, and kept having visions of European museums and castles. So with the little money I inherited from my poor mother, we took off for Europe, where I gave birth to a beautiful boy, Daja Wangchuk Meston. Feather with Daja Wangchuk, one day old. Geneva, 1970. Talk about karma! Lawrence and I ended up staying with these eccentric ex-pats outside of Geneva who took in young hippy backpackers. 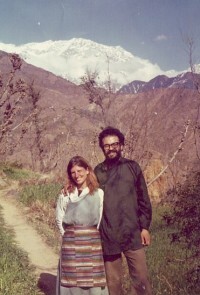 One couple we befriended there was Chris and Barbara Vautier who later stayed with us in their VW camper in Spain, went on to Dharamsala and were some of the original residents of Vajrapani Institute. From there we drove with the new born baby to Spain where word was it was nice and warm and cheap. We ended up in the south, renting a large hacienda in the middle of a huge lemon tree grove. 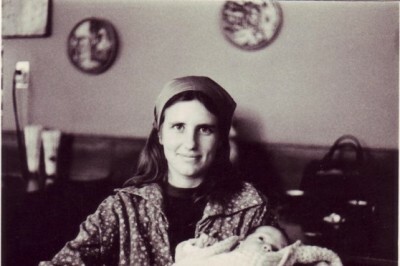 We were still pretty much living the hippie life and raising the new baby in the midst of which one day a package came for me from my dear grandmother. It was the compilation by Ram Dass that included My Story, Your Story, Our Story and Be Here Now, a CD of Hindu chanting and a huge poster with photos of various Indian gurus. Laura Huxley had befriended Ram Dass and thought my grandmother would enjoy his writings and adventures, knowing her interest in Eastern philosophy. In the midst of reading My Story, Your Story, Our Story a karmic seed suddenly blossomed in the very depths of my being. Ram Dass’ meeting and devoting himself to his guru in India, meditating at the ashram and having transformative experiences all felt so familiar somehow. Plus he was Jewish, well educated. Somehow I could totally relate, more so than just reading spiritual books by Eastern masters. I was never the same after reading that little booklet. All I could think about was finding out more information about the various holy men on the poster, about meditation and where to start. I became rather obsessed, but quickly realized that this inner light driving all my thoughts and intentions wasn’t something I could share with the other young people we smoked with, had picnics and the ever present drum circles with. Feather and Daja Wangchuk, 1973. We had to leave the lemon orchard hacienda for wealthy summer tourists so we went to Morocco where I ate one of the famous hash cookies that took my mind so far out I thought I’d never come back. This frightening experience coupled with my inner spiritual journey happening from reading and re-reading Ram Dass and any Eastern religion books I could find led me to making the decision to stop smoking, drinking – all of it. Basically, I was on my way to becoming a nun. The word on the road was that Greece was a nice, friendly and cheap place so off we went, in our green VW bus. We ended up in a small village at the northern tip of Corfu where we happily lived for a year. Lawrence painted, I took care of the baby, learned to cook from the local women who brought us fresh vegetables, eggs and olive oil made from their olive trees. And I continued my spiritual search, trying the meditations in Be Here Now and absorbing the teachings. One of the photos in the poster strongly attracted me, of Meher Baba who looked so kind and strong, as well as the quote below the photo that said, “Love conquers all, it cannot be denied” or some such. So I sent off for some of his books and became totally absorbed in this great Indian saint who had already died some years ago. I could tell that Meher Baba was the real thing, a realized being from his life story and his teachings. Daja Wangchuk in Greece, 1970. One day while living in the middle of an olive tree orchard in a barranka, a Greek hut made of bent tree branches and ferns, while reading one of Meher Baba’s books, he wrote, ‘You need a living guru, just reading books isn’t enough.” And later, “India is the spiritual mother of the world.” I put two and two together and informed Lawrence that we needed to go to India now. We packed up the VW bus and began driving. We crossed Yugoslavia, Turkey, Iraq, Iran and then on the road to Kabul the bus crashed into a deep pothole. Luckily, I had been lying down in the front seat so my head didn’t go through the windshield, Lawrence was thrown out onto the road, and the baby was in the back with our young, British hitchhiker. The car was totaled. We ended up staying over a month in Kabul at a sweet little guest house full of other young travelers, waiting for the Afghan police to OK our exit out of the country, getting bakshish (bribes) each time Lawrence went, daily, to the visa office. In the meantime I had a dream where Meher Baba clearly told me, “Don’t get another car. Sell most of your possessions and go quickly to India.” So I found some German travelers who were on their way to a place called Dharamsala to visit their brother who was studying something called Tibetan Buddhism at the Library of Tibetan Works and Archives. I had no idea about Tibet or His Holiness, but it was a ride to India, so finally off we went in their VW bus. After travelling through Pakistan, the last of the rather harsh, more violent feeling Muslim countries, we finally reached India. I could physically feel difference with great relief. I think I bowed down when we crossed the border. The first stop was Amritsar where the famous Sikh’s Golden Temple is. We stayed in a guest compound run by the temple in a simple concrete room with a shared outside toilet used by all the pilgrims. Yikes! is all I can say, even at the memory. But the atmosphere was still quite blissful, especially spending time at the beautiful, peaceful, spiritually charged temple where I felt like I was floating, transported as I walked along the marble pathways and exotic, waterways and lakes. Feather and Lawrence. Dharamsala, 1972. But now a decision had to be made: to find our way to Poona and Meher Baba’s ashram as planned, or continue to Dharamsala with our German friends. My usual way of making such decisions was to throw the I Ching. The answer came out to definitely go to the Dalai Lama’s new home in India. I immediately felt totally at home, comfortable and familiar with the Tibetans in McLeod Ganj, especially after the rough feeling of the Middle East. I loved how they dressed, their food, even the Tibetan tea and their calm, sweet energy. We stayed in the only hotel in town run by Tibetans, where Lawrence came down with hepatitis, probably contacted in Kabul. This meant staying in this part of India longer than I had planned, and gave me the opportunity to discover more about Tibetans and make friends with Westerners studying at the famous Library of Tibetan Works and Archives. I’ll never forget one day while sitting at a tiny Tibetan café sipping tea with some young foreigners, one French woman exclaimed, “There’s a dead fly in my tea!” Then Lars, a Dutch fellow said, “Poor fly! I hope she didn’t suffer too much!” I had never in my life heard anyone worry about a fly and was very impressed. Lars then explained he was studying Tibetan Buddhism at the Library. Something moved in my heart/mind and I decided I needed to investigate further. 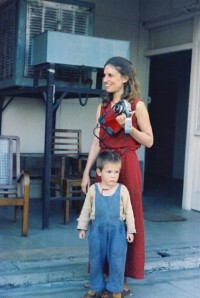 Glenn Mullin’s then partner, Roberta, offered to look after my baby while I walked down to the Library and took classes. From Geshe Ngwang Dargye’s first words while teaching Lama Atisha’s Lamp of the Path, I knew I had found what I was looking for. We stayed in Dharamsala for a year while I took every class offered at the Library and Lawrence continued his artist/hippie things. We moved down to the Library where Sherpa Tulku and Khamlung Rinpoche were Geshe-la’s young translators. I’d leave Daja with a Tibetan woman during class or one of the rinpoches would play with him. The only problem was the India visa situation. I had no intention of leaving the East once I had found my Buddhist home; I remember thinking I’d live in the forest in a tent if I had to. During our stopover in Delhi on the way to Kathmandu, as with many other foreigners, the American Express office couldn’t find the money transfer sent by my grandmother, without which we didn’t have funds to continue our adventures. So we ended up staying for a couple of weeks in Delhi at the Palace Heights hotel that I had heard of through Ram Dass’ book, going to the Amex office every day looking for our money. I got my long hair cut in preparation for becoming a nun. 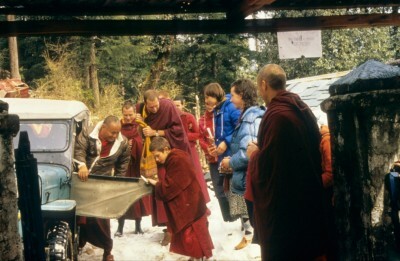 Wangchuk Meston greets Lama Yeshe at Tushita Retreat Centre, McLeod Ganj, India, 1982. Finally Amex found the money and off we went to Kathmandu. I couldn’t wait to get back to a Buddhist environment after the time in Delhi, so we immediately went up to Kopan. As we entered the gate, there I saw Lama Yeshe who looked like he was absolutely glowing as he sat on the steps leading up to the lama’s quarters. When Lama saw us, he immediately stood up and sort of reached out his arms towards us, as if he had been waiting for our arrival, which often seemed to happen. I felt totally uplifted and again, like I had finally come home. The rest is history, as they say. I never did make it to Meher Baba’s ashram in Poona. Do you have a story about the road that lead YOU to Kopan? If so, please so, we want to hear from you. Contact Laura@fpmt.org. 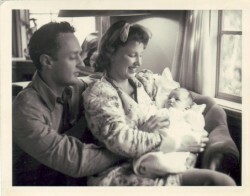 Feather Meston as a baby with parents. John Meston and Feather Meston, Hollywood, California. John Meston was co-creator of the very famous Gunsmoke TV series. Bette Ford, Ven. Thubten Wongmo's step-mother, in Mexico. Bette Ford was an actress, model and bullfighter. Bette Ford was the first American to bullfight in the Plaza Mexico.